Tera Lynn Childs is a new-to-me author. 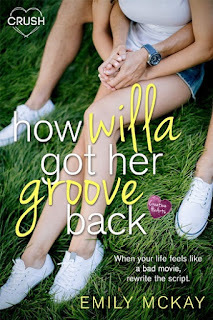 I started the Creative HeArts series on book 2 for review, then book 3. In preparation for book 4, I finally backtracked to read book 1. Sorry for sounding confusing, I assumed book 2 was actually the first in the series when I signed up to review, not realizing there were three separate authors and three separate couples, essentially three separate series rolled into one school with the same characters. So far so good, as I've 4-starred book one, and 5-starred both book 2 & 3. Ms. Childs' writing flowed fluidly and quickly, moving the story at a pace that was easy to follow along but wasn't bogged down in unnecessary detail. Sloane's narrative was told in first person, while Tru's was in third person, which was slightly jarring but did make it distinguishable between the female and male leads. Sloane had committed an egregious act, which we don't learn what truly happens until halfway through the novel. It wasn't truly a mystery of any kind, so I'm not sure why the author allowed the readers to stay in the dark, as it was the main focal point the entire plot was built upon. I liked Sloane, truly. I understood her as the quirky artist who felt powerless. I also simultaneously felt for her parents and felt them unfair. 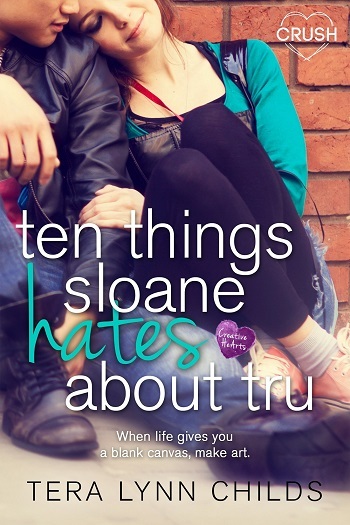 Tru, the charming, bad boy who's actually a good boy, next door neighbor, which Sloane hates ten things about... but as a reader, Sloane nowhere in the body of the book ever states a single thing she hates about Tru, nonetheless ten things... I liked Tru too, just as much as Sloane did. Tru is a misunderstood kid by his parents, yet everyone at school sees him clearly, especially his teachers. Obviously Sloane and Tru are reluctant love interests, and it was sweet and cute, and gave me the squees. There is a side mystery Sloane solves, that young adults will surely adore. As the first in the series, it was a good start. But after reading book 2 & 3 first, which I felt were incredible, I wish I had started where I was supposed to, as the series would have built – evolved – instead of feeling just on the surface without much depth. That was my issue: while I loved the author's voice, and Tru and Sloane, it felt like the story was missing something vital. I'm not sure if things were being left for a later book, but it felt unfinished plot-wise. It had everything it needed but never quite reached its potential – maybe explaining, to make it more realistic, (I don't know if this will be in a future book, but it was needed in book one – same with some resolution with Tru's father) that Sloane's parents split up instead of the waste of running two separate households while splitting up the siblings and the parents. That isn't realistic, doable, or anything an adult would have done. It would have been a family move, or Sloane moving with a relative. No mother leaves her husband and son to move across the country. Nope. That goes against the boundaries and structure Sloane was written to need. Unless, obviously, the parents split up, which is bad since Sloane is blaming herself, if that is the case, as Mom never says anything. Not a judgment – advice. This didn't effect my overall rating, but I do need to point out, and I'm not being overly critical or condescending, the book could have used another round of edits. Simple mistakes mixed with bad habits of the author, or perhaps punctuation rules never learned or put into practice. Most notable was the lack of proper commas. Example: "Night Sloane." Night Tru." There wasn't a night and day version of our characters. They were speaking to one another in dialogue. Commas matter. I sound nitpicky, but this was habitual throughout the entire novel, 90% of the time never doing it properly. Once put into practice, this won't happen but during a rare error, and won't put as much pressure on the editor. So that is why I'm pointing it out, for the author's benefit and growth. Been there, done that. I understand. Practice makes perfect and the rules do matter. Whether you're a young adult, or young at heart, I recommend both this novel and the Creative HeArts series to fans of the young adult genre, particularly those who enjoy the creative arts. Young Adult age-range: 14+, mentions of alcohol consumption, domestic violence, criminal activity, and kissing. Reviewers on the Wicked Reads Review Team were provided a free copy of Ten Things Sloane Hates About Tru (Creative HeArts #1) by Tera Lynn Childs to read and review. Review copy was purchased by the blog.